Re: Woohooo!! Two females with eggs!! Update P.6! BABIES!! He did!!!!!!!!!! And they are unbelievably cute!!! @Crabbielover1031: The links are no html-side, they are pdf. Maybe your browser needs some extras to open them? Wolf- have you heard from your hubby how the babies are doing? I need an update, I'm going through withdrawal! 7 PP's, 5 crazy E's! Crabbielover1031 wrote: Curlz, I couldn't view the links. But did you actually raise the larvae into little crabby babies yet? Or a browser that does it automatically, like Chrome. Curlz, thanks so much for being here! I think we can all learn a lot from you. It's very exciting that your crabs have eggs pretty much all the time. The people around here have only observed summer matings. I'm sure I will have a lot of questions for you, but I have to read over your document again to make sure they aren't already answered there. I'm on vacation right now, so it's hard to find time to sit down and relax. I just hope you stick around here for a while. My husband keeps doing water changes, but he says there are only a few live ones, and he doesn't know which stage they are in. He says most are dead on the crushed oyster shells. I told him he may not be seeing the glaucothoes on the bottom, but I dunno. He seems to think it's pretty much over. He said he is still going to do water changes until he sees no more live ones. I think with Curlz's information, I will modify my set up for next year a bit. I'm very excited to know for sure that it CAN be done outside of a lab. That's such great news. Of course, you may may use any of my photos and videos. This is wolf's thread and I interrupted it. Let's keep our fingers crossed for the last ones. I will open a new thread with a short story about my terrariums. I was asked for it in the chat. 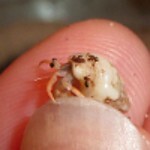 And I will show some babie hermit pictures. @wolf: on the 3 of August the Glaucothoe seems to be very near to start searching for shells (mine start to examine shells on day 25). The dead one laying at the money on one of your pictures is showing a nearly fully devoloped Glaucothoe. Mine looked not as fully devolepd as this one as they took shells. They took shells longer as some hours at day 32. At this point we put them into a second tank with a water pool and sand. A treebrunch for climbing out the water. But as they got the mysis and krill the stop cannibalism. Yes and there are a lot of things the same as in my experiment! In the diagram on the last side of my sheet you can see the attrition rate. Approximately. That's absolutely amazing Curlz! I'm on Chrome now and saw the pictures, they are sooooo amazingly cute! That's great you got Violas to breed! 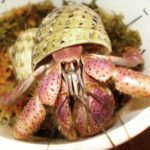 What kind of crabs do you have access to over in Germany? Which kind is most commonly sold? Over here it's purple pinchers. I have 8 crabs available for adoption, please PM me if interested. I can't imagine Herbit eating his siblings. He is just so passive and peaceful. He is so passive, that when all the hermits were fighting over a log spot (there is plenty of room), Herbit went in his shell and Friendlyfeat, of all crabs, actually picked him up and scooted him out of the log and left him there. That's how passive Herbit is, even the unfriendly ones protect him. Maybe as a baby he was a completely different hermit lolz. annopia has a C. Scaveola (I don't think I spelled that right...) and it's gorgeous! It has molted with her a few times too! I find it odd that you can't get C.Variabilis, since we can get strawberries (C. Perlatus) over here in the U.S., and they come Australia and Japan, and Micronesia. Am I confusing you when I say Aussie, Blueberry, Strawberry? And I forgot to ask you, Curlz, could I please have permission to share your pictures on my Facebook page for my hermit crab rescue? 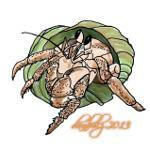 I own Caring Claws Hermit Crab Rescue, and I've been updating everyone with baby news! So could I use some of your pictures? I would give you credit, of course! Would you like me to use your name, or just "Curlz of HCA"? And another question: If you walk into a store, and they have hermies, they have all different kinds? We only have either C. Clypeatus, C. Compressus (hard to find depending where you live), and C. Perlatus (pretty hard to find, you usually have to order them). Crabbielover1031 wrote: I find it odd that you can't get C.Variabilis, since we can get strawberries (C. Perlatus) over here in the U.S., and they come Australia and Japan, and Micronesia. Australia doesn't allow the export of variabilis (Aussie Crab or Crazy Crab), which is why no one outside of that country can get them. One person had a trial permit to export them to one person in the US to see if it was something that Australia was comfortable with allowing, but it was only good for a few shipments and it hasn't been renewed.